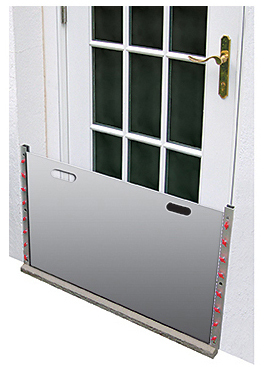 Flood Barrier Shields protect doors and windows and prevent water ingress. They are 1/4-inch-thick marine-grade aluminum custom-fitted panels that attach to door frames or adjacent walls with pre-mounted channels. A closed cell sponge neoprene ensures impermeability. Available in any height as model #2070 for doors and model #2080 for windows.